Do you really need an expert to help make decisions for you? What does that say about your services? That you’re willing to pay a pretty penny for someone to tell you what you could discover on your own. 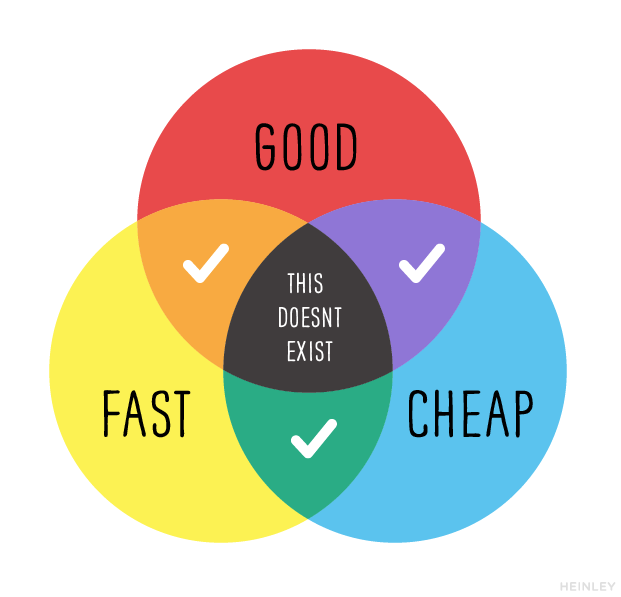 Sure, experts help facilitate speed and quality of your product and services, but is the price worth it? Sure, it’s fine for brands with Apple sized budgets. But what about bootstrapped startups and financially conscious brands? Is their preference for launching a minimal viable product (MVP) and optimizing along the way to go? Well, that all depends on your business. Ultimately, what you want to consider is the return on your investment in paying out for their expertise, and is it necessary before you launch? There’s a famous quote attributed to gas and fire suppressing expert, Rod Adair. We were reminded of it by the article from David Berkus of Berkonomics, Good, cheap, fast. Pick any two. We all want to offer the best product as quickly as possible with the best margin that makes sense. But the reality is that it’s near impossible to provide something of quality in a quick way that is also reasonably priced. Due to these limitations, the intersection of all three points of emphasis can’t exist and won’t work in your favor. So the point then is to decide on the two most important and make that the focus of your offering. When you place your focus on expertise, you’ll be omitting fast from the options available to your offering. Experts are costly, and to achieve the results you want means they’re going to need time.. The master craftsman isn’t going to cut a corner with their work – their reputations are at stake if they do. So how do you decide if using experts is the right strategy for you? An area of high competition that is already market saturated. A technically sophisticated market where expertise is critical to success. Think technology, CRO, SEO and the like. Where the competition already has traction and is ahead of you and your offerings. To paraphrase this great article by Jono Alderson, In essence, it’s important to utilize the value of expertise but in such a way as to create a strategic partnership which helps create skin in the game for the use of expertise. Let’s say you’re entering the smartphone market. You have a unique design on an otherwise well-worn device. The problem you’re going to have is to convince the market that your basic, introductory phone is comparable to the leaders like iPhone and Galaxy. Simply put, your phone can’t match the market’s expectations in comparison with these industry giants. You’ll fail – unless you have the expertise behind the design and creation of your product that can really make it stand out in a highly competitive, well-defined marketplace. This is an example where execution alone won’t be a viable strategy for an existing consumer market. You’ll fail, so why bother? The worst thing a business can do is deliberate for too long in their product offering. Tweaking the design, the form, the speed, the options, can overwhelm the design. When this happens, it’s paralysis by analysis that can and will delay the launch indefinitely. Sometimes the best thing to do with your product is to get it to market and improve upon it, tweak it, and scale it in time. Even in situations where expertise is going to be critical, the key here is to move to launch as quickly as possible. Depending on the maturity of the market, it may be ideal to think of your approach in a more “start-up” type mindset. A mindset that focuses and strategizes on making a minimal-viable-product that can evolve and be tweaked for optimization and expand over time. The key then is launching an MVP as quickly as reasonably possible. Let’s look at some of the largest players in their markets as examples. Believing in the power of their search engines and algorithms, Google stayed focused on its one product for the longest time. And in many ways is still the primary focus. Only comparatively recently has it branched out into other offerings, from new software applications to physical hardware. Facebook is another great example. The story of Facebook’s origins in a Harvard dorm room is well known. But from their start, Facebook was a social networking application. They focused on building a simple platform to share images, and except for dominating the world with their platform; not much has changed. In the last couple years, Facebook has gone more horizontal with their offerings, but they still stay true to their essential function. Dropbox is an example of how to launch a minimal-viable-product the right way. At launch, Dropbox offered a simpler service. Rather than deliberate and delay the launch until they had a polished site and complicated product, they launched a simple explainer video. A video that outlined what early adopters would receive. The main takeaway is that offering an MVP can be a good way of avoiding delays in getting to market. It works best in areas of underdeveloped, unsaturated markets. But you’re going to have to stay on the ball to continually evolve your offering and get it out of the MVP phase as soon as possible. But to effectively utilize both strategies of expertise and execution requires a highly targeted concept and plan. For example, let’s go back to the smartphone discussion from earlier. Yes, you could launch a stripped-down, basic smartphone and it’s most likely to fail. But if you target your customer in such a way as to offer them a smartphone that is unique,different and that fulfills their needs and wants it different ways, it may have a chance. Perhaps your smartphone is built with less clutter in the hardware. Or maybe it came with a software ala-cart style operating system and was able to be worn on your wrist. If you priced it well under the major players, you may be able to establish a foothold as a niche service provider. This strategy would require you to balance between the expertise to build a remarkable phone while still being able to execute the launch simply and quickly. Whether looking to get to market quickly and cheaply, or looking to scale a bare-bones product over time, deciding between expertise and execution is one crucial step in your product development. Depending on the type of product and service, there may be one strategy, or perhaps using a little of both, that makes more sense for you. What do you think is the most effective strategy for your product? Is expertise more valuable than execution, or is there value in a combination of the two? Tell us what you think is the most useful tactic and why.